We report an exceptional radiographic presentation of bilateral insufficiency fractures of the proximal tibia in a 67 year old women with rheumatoid arthritis (RA). The patient developed RA at the age of 55. She was consecutively treated with several disease modifying drugs : parenteral gold (1989–90), sulfasalazine (1990–91), and methotrexate (MTX; started in 1991 and discontinued in 2001 because of bone marrow suppression); chloroquine was added from 1993 until 1999. Oral corticosteroids (prednisone 5 mg/day) were started in 1990. Because of persistent hydrops of both knees a bilateral chemical synovectomy (osmium acid) was undertaken in 1990. Afterwards three intra-articular infiltrations with depot corticosteroids were given, and the arthritis of the knees resolved. Bone mineral densitometry (BMD) in 1994 showed a T score (compared with young adults) at the lumbar spine of −2.6 standard deviation (SD) and at the femoral neck of −2.7SD, compatible with osteoporosis. Treatment with calcium supplements and alfacalcidol (50 μg/day) was started as this was the only treatment for glucocorticoid osteoporosis which was reimbursed. Because of further bone loss (follow up BMD still showed a T score at the lumbar spine of −3.2 SD and at the femoral neck of −2.8 SD) cyclical etidronate, the only available bisphosphonate at that time, was given. In 2000 both knees were examined radiographically because of recurrence of bilateral hydrops. Both knees had an extensive area of periarticular osteoporosis in the tibial plateau and both femoral condyles (fig 1). The osteoporotic areas in the tibial plateaus were demarcated by a focal band-like sclerosis, representing impacted bone trabecula (arrows). Additionally, a fine condensed sclerotic line was seen in the right femoral condyles and less prominently in the left femoral condyles (arrows). Retrospectively, the sclerotic bands appeared to be already present on a radiographic examination in 1994. The diagnosis of old bilateral insufficiency fractures was made and confirmed by magnetic resonance (MR) imaging. The turbo spin echo T2 weighted MR image with fat saturation of the right knee showed features of RA, including multiple high signal intensity subchondral cysts in the femur and tibia, erosion of articular cartilage, meniscal degeneration, and marginal bone erosion. More importantly, a hypointense line was seen in the proximal tibial epiphysis and medial femoral condyl (arrows), representing increased susceptibility from impacted bone trabecula (fig 2). This hypointense line was associated with only a minimal area of high signal intensity bone marrow oedema, suggesting that these insufficiency fractures were of an older age. 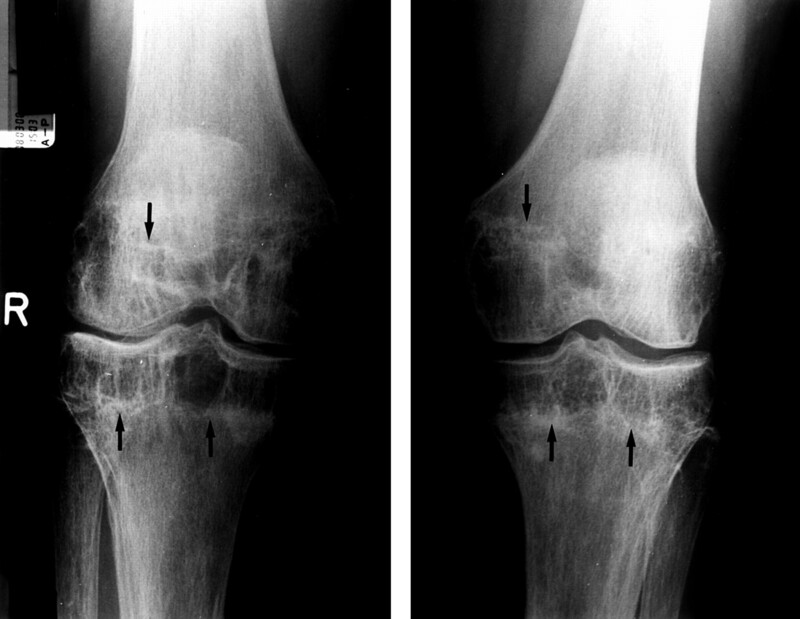 The exceptional radiographic image of both knees thus related to the sclerotic bands, representing insufficiency fractures outlining the periarticular bone density loss due to RA. Radiographic examination of both knees. The osteoporotic areas in the tibial plateaus are demarcated by a focal band-like sclerosis representing impacted bone trabecula (arrows). Turbo spin echo T2 weighted MR image with fat saturation of the right knee. Arrows indicate a hypointense line associated with only a minimal area of high signal intensity bone marrow oedema, suggesting that these insufficiency fractures are of an older age. Two types of stress fracture can be recognised: fatigue fractures, resulting from the application of abnormal repetitive stress or torque to a bone with normal elastic resistance, and insufficiency fractures, occurring when normal stress is placed upon an abnormal bone.1 In this case the stress fracture was an insufficiency fracture. These insufficiency fractures are more commonly seen in RA and osteoporosis.2 Juxta-articular and/or generalised osteopenia caused by extensive rheumatoid involvement, corticosteroid treatment, or relative immobility, is a predisposing factor.3 These conditions result in an abnormal bone and were all present in our patient. Additionally, stress fractures due to MTX osteopathy have been reported in long term, low dose MTX treatment for RA.4–6 Insufficiency fractures in the knee are, however, a rare complication of MTX treatment in a patient with RA. Most insufficiency fractures during MTX treatment occur in the distal tibia and feet; a localisation in the meta-epiphysial region of the knee is rather exceptional.5,7 Because our patient with RA had apparent osteoporosis and was treated with a combination of corticosteroids and MTX, the cause of the insufficiency fractures cannot be exclusively attributed to the MTX treatment. Any relationship of the insufficiency fractures with the earlier chemical synovectomies is unclear but cannot be excluded. 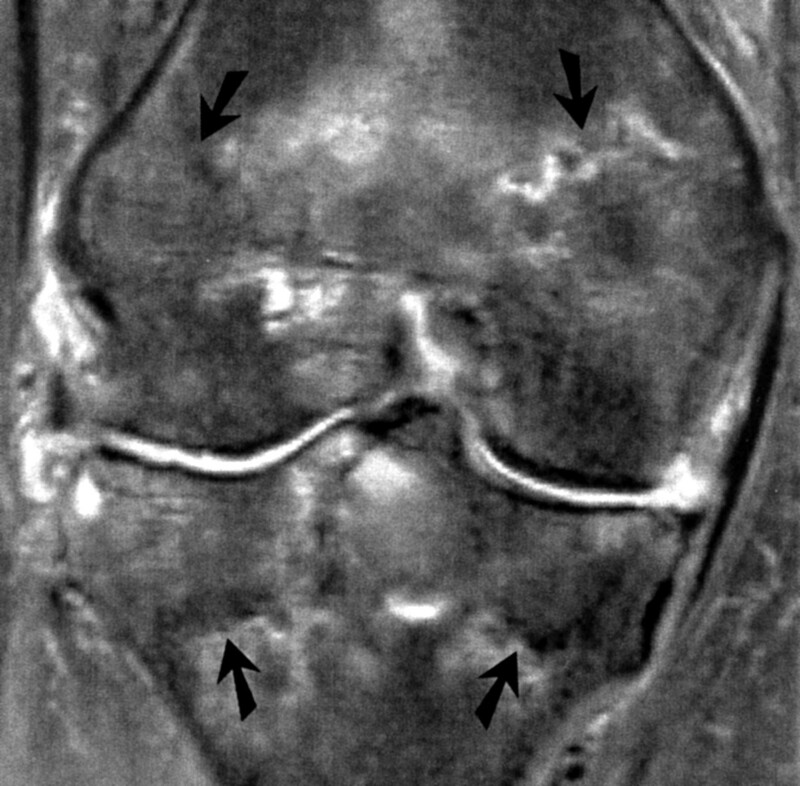 The radiographic presentation of a stress fracture in the epiphysial region of the proximal tibia is a horizontal band-like focal sclerosis, representing condensation of trabeculae, mostly without prominent periosteal reaction. Symmetrical involvement, as in our patient, is not unusual.1 The findings in our patient with extensive periarticular bone loss (due to rheumatoid knee involvement), demarcated by a contrasting horizontal band-like sclerosis, caused by bilateral stress fractures of the proximal tibial epiphyses, is, however, a rather exceptional radiographic presentation. Resnick DR, Niwayama G. Diagnosis of bone and joint disorders. Philadelphia: Saunders, 1995:2580–3. Schneider R, Kaye JJ. Insufficiency and stress fractures of the long bones occurring in patients with rheumatoid arthritis. Radiology1975;116:595–9. Wijnands M, Burgers A. Stress fracures in long term methotrexate treatment for psoriatic arthritis. Ann Rheum Dis2001;60:736–8. Semba CP, Mitchell MJ, Sartoris DJ, Resnick D. Multiple stress fractures in the hindfoot in rheumatoid arthritis. J Rheumatol1989;16:671–6. Zonneveld IM, Bakker WK, Dijkstra PF, Bos JD, van Soesbergen RM, Dinant HJ. Methotrexate osteopathy in long-term, low-dose methotrexate treatment for psoriasis and rheumatoid arthritis. Arch Dermatol1996;132:184–7. Maenaut K, Westhovens R, Dequeker J. Methotrexate osteopathy, does it exist? J Rheumatol1996;23:2156–9. Maenpaa HM, Soini I, Lehto MU, Belt EA. Insuffiency fractures in patients with chronic inflammatory joint diseases. Clin Exp Rheumatol2002;20:77–9. Shapira D, Scharf Y. Insufficiency fracture of the distal tibia mimicking arthritis in a rheumatoid arthritis patient: the possible role of methotrexate treatment. Clin Exp Rheumatol1995;13:130–1. Dequeker J, Maenaut K, Verwilghen J, Westhovens R. Osteoporosis in rheumatoid arthritis. Clin Exp Rheumatol1995;13(suppl 12):S21–6.